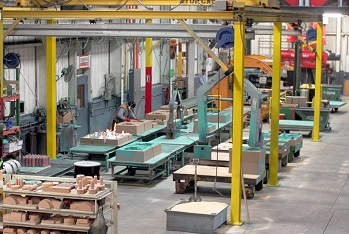 A premier foundry cannot deliver quality casting products without a technologically advanced facility and a flexible and efficient casting process. At Northern Stainless, our industry-leading facility allows us to be a nationally recognized foundry and a trusted name for our customers. The first step in producing a sound casting is building a precise pattern. We’ve partnered with highly skilled pattern makers to build tooling that meets your manufacturing design. Rigging a customer's pattern correctly yields a sound casting. Knowledge of gating, metals poured and cooling rates are all essential when setting up a pattern for stainless steel. In cases where existing customer pattern equipment arrives at our shop, the tooling is checked for accuracy and stainless shrink rates. Our pattern technicians, engineers, and sales staff work in coordination to complete all pattern setup requirements. If you do not have existing tooling, we will build your equipment at a competitive price. Sample castings are always verified and documented to customer drawings and specifications. Anything less is simply an incomplete job. Northern Stainless is most competitive and successful on complex pressure-retaining castings which likely have complicated, fragile cores. Impellers, volute cases and diffuser bowls all require extremely smooth internal passageways for reliable performance. We use a variety of core sands and processes depending on the casting type and customer specifications. To further improve quality and capacity, a Tinker Omega NextGen 2 Core Room was installed in early 2015. This complete package includes two mixers, a core shooter, sand heaters, and a two sand blending system. Our Air Set molding system is known for combined flexibility, modern material handling and mixing equipment. Our molding system supports all types of pattern equipment, with an emphasis on quality. While we mostly run cope and drag boards, we also have the ability to mold squeezer match plates and loose patterns. Our location in Pewaukee, Wisconsin is a particular advantage to our molding process. Wisconsin is known for its quality foundry sand. Our indoor silos house sand certified to a specified grain size distribution, yielding superior casting finishes. Northern Stainless utilizes a sand reclamation system, which recycles processed sand to save our customers money and minimize environmental impact. In order to ensure our facility is state-of-the-art, Northern Stainless continually invests in new technology. Our most recent investment towards improving quality and productivity was a Tinker Omega NextGen 2 molding system, which was installed in July 2012. The heart of this system is a programmable logic controller (PLC) controlled mixer which, through a recipe management system, is capable of using two different types of sand to create the best possible sand mix for the current job being molded. Our ability to handle many mold sizes gives our jobbing shop the opportunity to be cost-competitive on small and large casting, from 1 to 1,000 pieces. The stainless steel melting and pouring operation is the most critical part of making a quality casting. Predetermined procedures must be followed to control variables in the melting and pouring process. The integrity of the alloys we pour is the backbone of the end product. To insure the highest quality melt, each batch we pour is argon-purged during the melting process by utilizing the porous plug process. Final predetermined temperatures are reached and the furnace is tapped into the preheated pouring ladle. It is imperative the metal gets to awaiting molds in a timely manner to maintain the extreme temperatures. This traveling molten metal can be as hot as 3,000°F. Our experienced employees quickly and smoothly fill the molds from the ladle of molten metal. In September 2007 we completed installation of an Inductotherm VIP 600 kW melting system with a 2200 lb. furnace. Additionally, our melt deck contains a 450 kW Pillar Mark VIII with a 1,300 lb. furnace and a 275 kW Pillar Mark V with a 500 lb. and a 1000 lb. furnace. Our Inductotherm VIP further displays our commitment to using the most advanced foundry technology available. Our job isn’t done when we pour the casting. The chemical analysis of each heat of metal we pour is confirmed by our spectrometer, documented and certified to specification. Our state-of-the-art LECO metallographic equipment allows us to verify and refine our processes to provide the best possible microstructure for our customers. We also perform mechanical tests and report physical properties if requested. 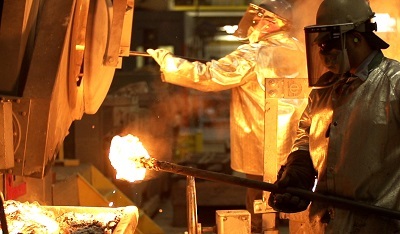 The facility at Northern Stainless has a cleaning room capable of handling a variety of castings. We utilize a unique upgrading process which feeds castings to grinding cells. This process also provides expedited processing, allowing us to deliver products in less than lead time requirement. Pump castings and other pressure-containing rough castings are pressure tested at Northern Stainless. Machined castings can be hydro tested upon request. This procedure allows us to evaluate and certify the integrity of our castings. We guarantee no leaks through casting walls. When we’ve finished an order, our castings are carefully packaged and ready for shipment to customers. The same care used in manufacturing is used in the packaging and shipping process. Our job is done only when our customers receive the final product. For all your foundry needs, contact the stainless steel casting company at Northern Stainless today for a free quote.